Gaynor Goffe : Teaches a wide range of calligraphic topics for one-day, weekend and longer workshops to regional calligraphy groups. Please enquire for further details. She also teaches one-day or longer courses at her home in Cambridgeshire, for small groups, a wide range of calligraphy topics available. 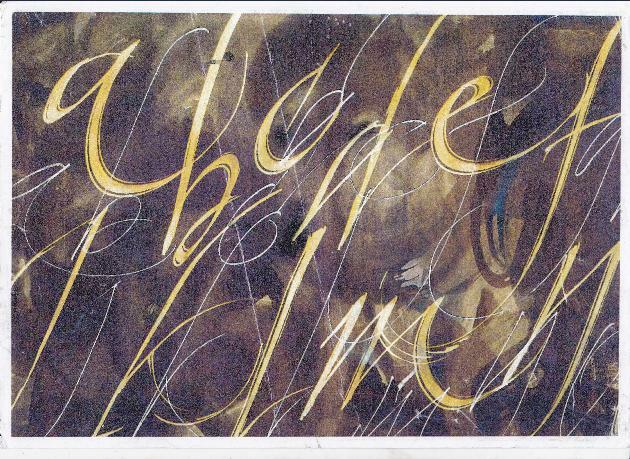 Tom Perkins : Teaches drawn and carved lettering short courses to regional groups. Please enquire for further details. He also teaches week-end or longer courses at his workshop in Cambridgeshire, for 6-8 people, in letter carving in stone and drawn lettering. Half and one-day workshops also taught at home, approximately once a fortnight, weekdays and Sundays, near Ely, Cambs, please e-mail for further details and dates. I am available for one day, weekend and longer workshops on the following topics, please contact me if you wish to arrange a workshop. 2)Contemporary Variations- Any of the above are available as more advanced workshops with script variations, or mixed-level workshops covering basics and variations. For further details please contact the organising body, or Tom if necessary.